"It's Football Time In Tennessee!" Tennessee has had its share of athletes who have gone on to have successful careers in college and professional sports, but without a doubt one of the most successful is John Majors. 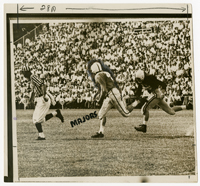 As a high school player at Huntland High School, Majors was an outstanding all-around athlete who held the record as State Overall Scoring Leader in football for three consecutive years in 1950, 1951, and 1952. 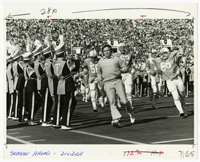 As a player at the University of Tennessee, Majors led the Volunteers to an undefeated, untied regular season record of 10-0 and an appearance in the Sugar Bowl. While at Tennessee, Majors was All-Southeastern Conference twice and was voted player of the year in the Southeastern Conference twice by the Nashville Banner in 1955 and 1956. Majors was also NCAA All-American; United Press International National Back of the Year, 1956; Atlanta Touchdown Club’s SEC back of the year, 1956; and Heisman Trophy runner-up in 1956. From left: Hal Bridges, Edd Cantrell, Bobby Proctor, John Majors, Bob Neyland, Jr.
You Can Go Home, by Johnny Majors with Ben Byrd, 1986. Majors began his professional coaching career with the University of Tennessee as a student-assistant in 1957, becoming an assistant coach in 1958 and 1959. He was assistant coach at Mississippi State from 1960-1963 and was assistant coach at the University of Arkansas from 1964 through 1967, when Arkansas won the National Championship in 1964. 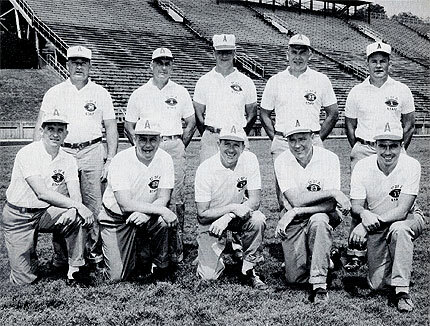 As head coach at the Iowa State University, Majors rebuilt the struggling Cyclone football program, taking the team to their first-ever bowl games in 1971 and 1972 and winning Big 8 Coach of the Year in 1971. Here Majors poses with his staff. 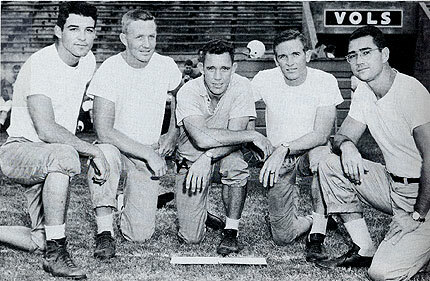 From left: Jack Blazek, Jackie Sherrill, Ollie Keller, Joe Madden, John Majors, Larry Lacewell, Jimmy Johnson, Gordon Smith. Majors would once again rebuild a failing football program as head coach at the University of Pittsburgh, where he took the Pitt Panthers to the Fiesta Bowl in 1973 and ultimately led them to a National Championship 1976, winning National Coach of the Year in both 1973 and 1976. 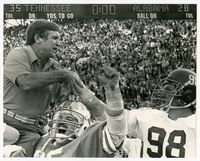 Majors returned to the University of Tennessee in 1977 as head coach of the Volunteer football team. His career with Tennessee would span fifteen years and include ten bowl appearances, seven of which resulted in Tennessee victories; three SEC Championships in 1985, 1989, and 1990; and an overall win/loss record of 116 and 62. Majors was voted Coach of the Year in 1985/86. Majors returned to the University of Pittsburgh as head coach in 1993, and in 1997 he became Director of Athletics and Special Assistant to the Chancellor at the University of Pittsburgh. Majors continues to stay active in college football as speaker, team evaluator, and recruiter. Bumper sticker commemorating Majors’ return to the University of Pittsburgh as head coach in 1993. John T. Majors Papers, Tennessee State Library and Archives. The John T. Majors Papers, including an original donation and a later addition, consist of 57.5 linear feet of materials. The collection covers the years 1942 through 2007 and consists of correspondence, clippings, playbooks, notebooks, scrapbooks, notes, photographs, plaques, programs, publications, scouting and game reports, audio and video recordings, films, and other miscellaneous items. The original donation of approximately 20 linear feet (excluding audio and video) is also available on microfilm. 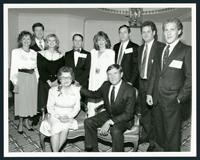 From left: Larry, Shirley Ann, Bill, Joe, and John Majors. 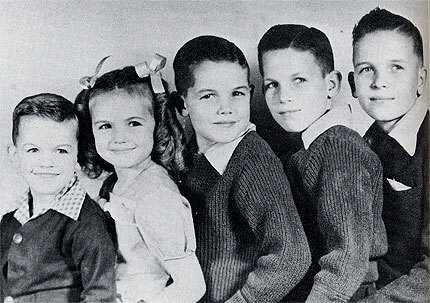 A young John Majors with his brothers and sister. Missing is youngest brother Bob, who was born when Majors was fourteen years old. John Terrill Majors was born in Lynchburg, Tennessee, into a sports-minded family, although books and music were also prevalent in the Majors home. Family and friends can’t remember a time when John, even as a young child, was not engaged in some type of sports activity. Majors’ father, Shirley Inman Majors, was a gifted athlete who excelled in football, basketball, and baseball at Moore County High School, Lynchburg, Tennessee. 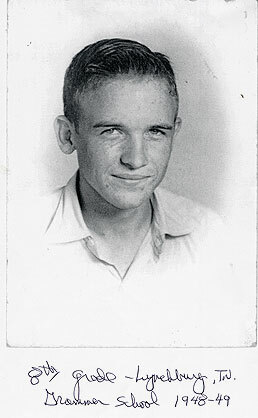 The elder Majors had a passion for coaching and began his coaching career at Moore County High in 1944. After coaching three years in Lynchburg and two years at Decherd, Tennessee, he was offered the opportunity to restart the football program at Huntland High School, which had not had a team in over twenty years. 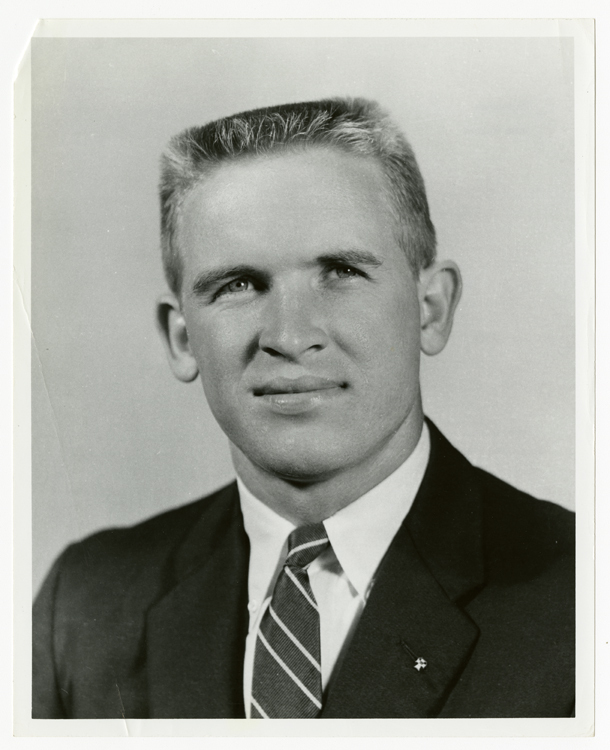 The elder Majors finished out his coaching career as the head football coach at the University of the South, Sewanee, Tennessee, for 21 years and coached the only two undefeated, untied teams in the twentieth century, in 1958 and 1963, at Sewanee. From left: Father Shirley, John, mother Elizabeth, brother Larry, sister Shirley Ann, and brother Bill, with youngest brother Bobby in front. Life magazine photo from the 1960s featuring the Majors family. 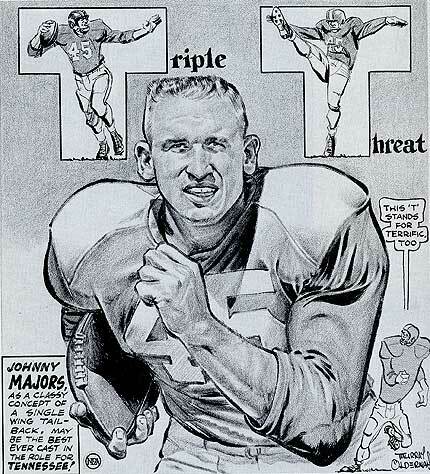 John Majors began his high school education in 1949 at Lynchburg High School, where he played football as a freshman. 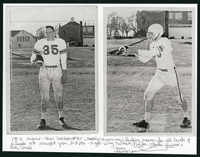 Majors’ Lynchburg team experienced a dismal season that year, with their only victory being a 18-13 win over his father’s Huntland High team in the last game of the season. This loss didn’t sit well with the elder Majors, who declared that that it would be the “last dad-blamed time a son of mine plays against me,” so he packed up the family and moved them to Huntland. In addition to John, three of his brothers—Joe, Bill, and Larry—also played for their father at Huntland. Between the years 1950 and 1956, Coach Shirley Majors’ teams ran up an impressive record of 70 wins, one loss, and one tie. Majors and Other Members of the Huntland High School Football Squad. 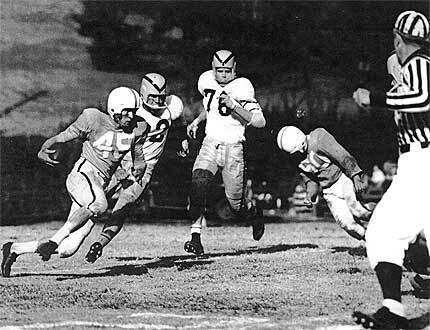 The Huntland Hornets were 9-1 in 1952, when Majors led the state in overall scoring with 213 points. 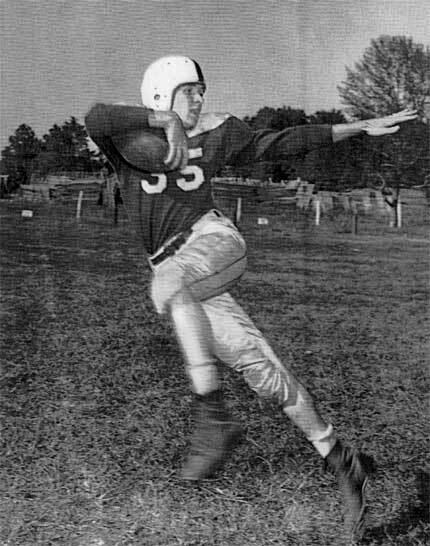 At Huntland High School under his father’s coaching, John Majors was an outstanding athlete: he held the record as State Overall Scoring Leader in football for three consecutive years, from 1950 through 1952. Majors scored 153 points as a sophomore, 161 points as a junior, and 213 points as a senior. For all four of his high school years, Majors scored a combined total of 564 points. In his senior year at Huntland, Majors rushed for 2,550 yards, averaging 17.7 yards per carry, and was named to the All-Midstate team by both the Nashville Banner and Nashville Tennessean. 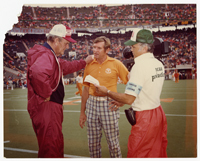 From left to right are Quarterback Johnny Majors, End Buddy Cruze, and Tackle John Gordy. After his impressive years at Huntland High School, with a senior year that included an incredible 2,550 rushing yards, Majors received a tremendous amount of attention from college recruiters. The majority of the Southeastern Conference schools contacted him, as did as others from Wyoming, Arkansas, Virginia, Virginia Tech, and West Point. Majors finally narrowed his decision down to the University of Tennessee and Auburn University, and, when he was having a difficult time making up his mind, his mother, John Elizabeth Bobo Majors, said, “Well if there’s not any big difference between Tennessee and Auburn one way or the other, I’d just as soon you stayed in the state.” Majors’ decision to play at the University of Tennessee had been made. 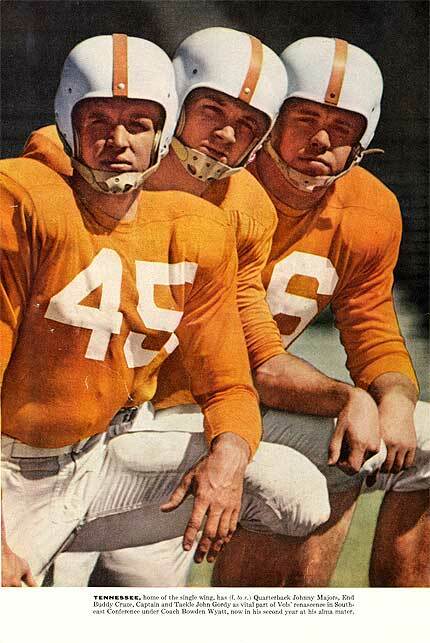 Majors was among the 127 freshmen recruited for the 1953 football season, the last freshmen class recruited by UT’s famous coach, General Robert “Bob” Neyland. 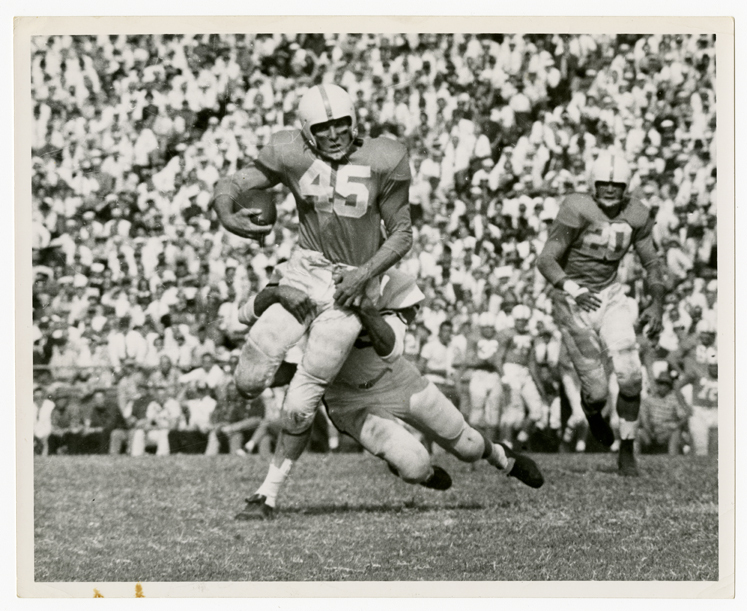 Tennessee vs. Vanderbilt, 1956 Majors (number 45) displays his explosive running ability. 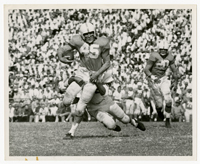 As a player at the University of Tennessee, Majors led the Volunteers to an undefeated, untied regular season record of 10-0 and an appearance in the Sugar Bowl. 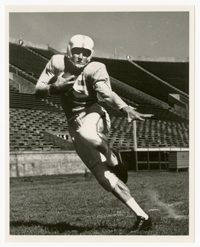 While at Tennessee, Majors was All-Southeastern Conference twice and voted player of the year in the Southeastern Conference twice by the Nashville Banner, in both 1955 and 1956. Majors’ honors during his years at Tennessee also included selection as a unanimous All-American; United Press International National Back of the Year, 1956; Atlanta Touchdown Club’s SEC back of the year, 1956; and Heisman Trophy Runner-Up in 1956. 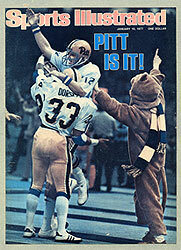 Sports Illustrated cover of January 10, 1977, celebrating the Panthers’ Sugar Bowl, 27-3. Majors took over a struggling football program when he was appointed head coach at the University of Pittsburgh in 1973. He immediately pressed the university administration to increase the number of football scholarships that could be offered, as well as to improve conditions for the players by renovating the existing stadium, building a first-rate locker room and upgrading the training facilities. 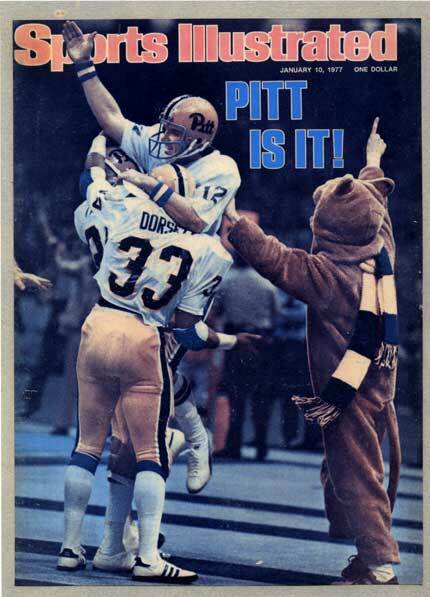 In an effort to build the Panther team, Majors focused heavily on recruiting, especially in Pennsylvania, and wound up luring the highly rated running back Tony Dorsett to play for Pitt. With a team built around the outstanding athletic ability of Dorsett as well a number of other stand-out players, Pittsburgh finally had a winning year in 1973, going 6-4-1, and earning themselves a trip to the Fiesta Bowl. Majors was named National Coach of the Year. By 1975 a confident and improved Panther team had finished their season with a 7-4 record and a 33-14 win over a good Kansas team in the Fiesta Bowl. 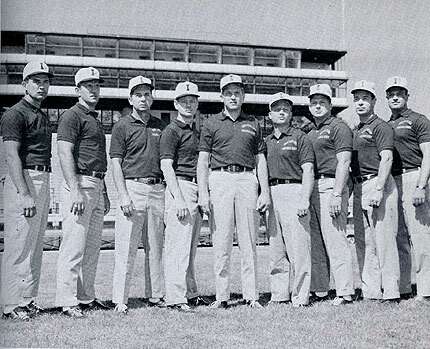 Before the 1976 season Majors believed that the Pittsburgh team had both the experience and the drive to take them all the way to the National Championship. Majors was proven right when the Panthers finished the season an undefeated 12-0. That year they would go on to play Georgia in the Sugar Bowl, beating the Bulldogs 27-3 and winning the National Championship. Majors was again voted National Coach of the Year, and the extraordinary Tony Dorsett won the Heisman Trophy in 1976. 1941-1950 Educated in Lynchburg elementary and secondary public schools. State Overall Scoring Leader (football) 3 consecutive years: (Huntland H.S., 1950–153 points); (Huntland H.S., 1951– 161 points); (Huntland H.S., 1952–213 points); total points scored in 4 years: 564 points (including Lynchburg, Moore County, TN, in 1949). 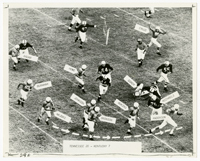 Majors played the single wing tailback, a position that demanded skill in passing, running, and punting. 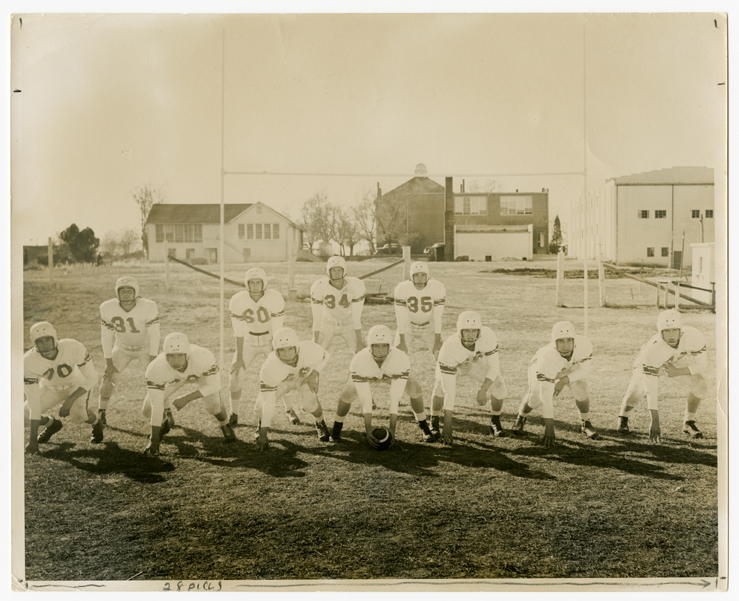 1952 Huntland High School starting football team that finished 9‐1 using the single wing offense. 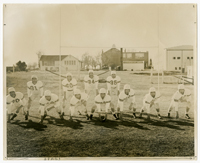 John Majors, number 35, played tailback (2nd row far right). This team led all schools in Tennessee in scoring for the third year in a row (1952 ‐ 213 points; 1951 ‐ 161 points; 1950 ‐ 153 points). 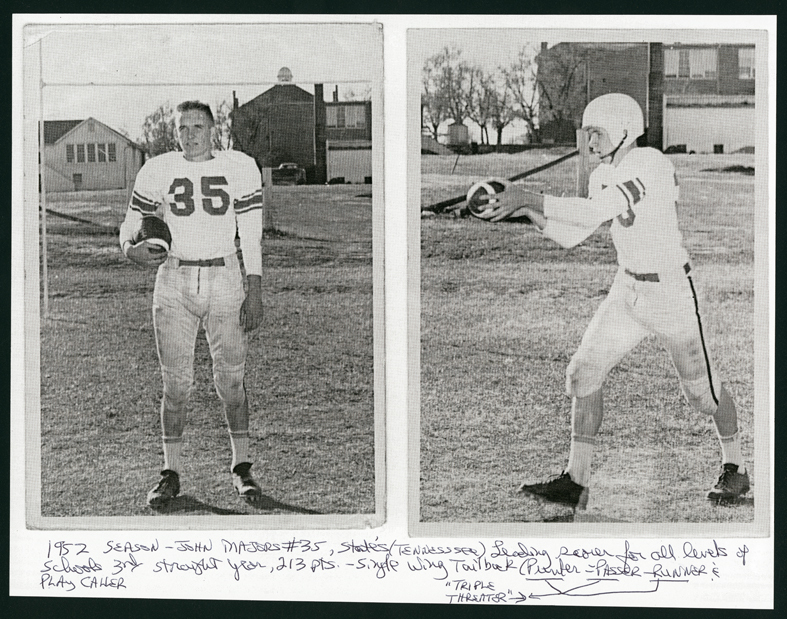 Two photographs of John Majors in his high school football uniform. In the on the left, Majors stands holding a football in his right arm without a helmet. 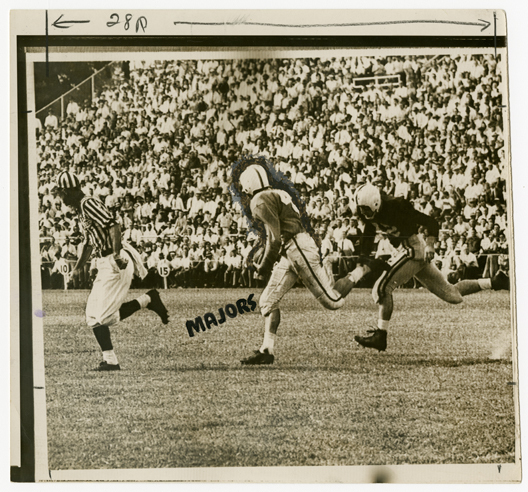 In the photograph on the right, Majors is punting a football. Football coach John T. Majors at the reception for his induction into the National Football Foundation Hall of Fame. 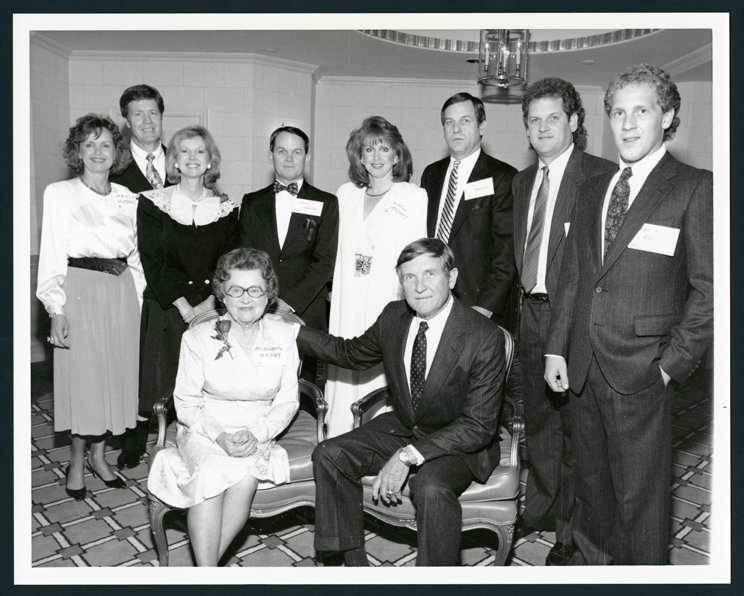 Coach Majors is seated on the right next to his mother, Elizabeth Bobo Majors, and surrounded by his family. The reception was sponsored by the University of Tennessee. 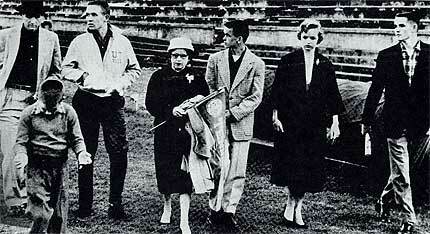 Coach John T. Majors shaking hands with a University of Alabama football player, Jackie Cline (no. 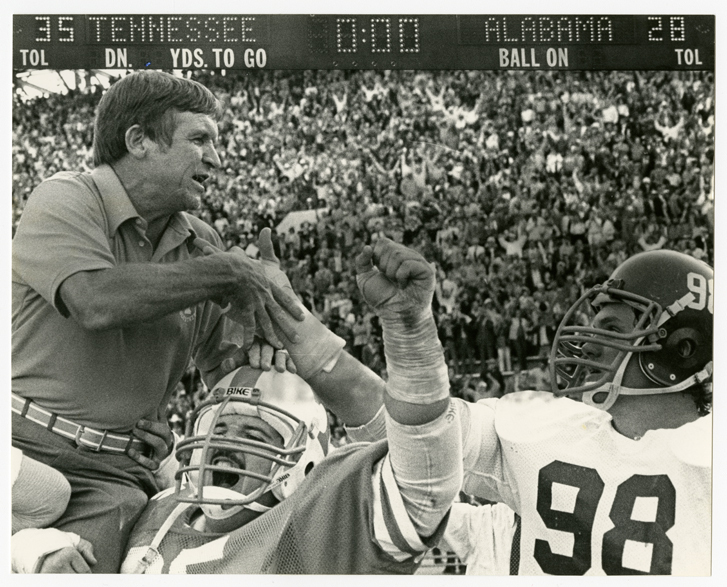 98) while being carried by his players following a victory over UA in 1982. The scoreboard shows the final score to be Tennessee, 35 and Alabama 28. 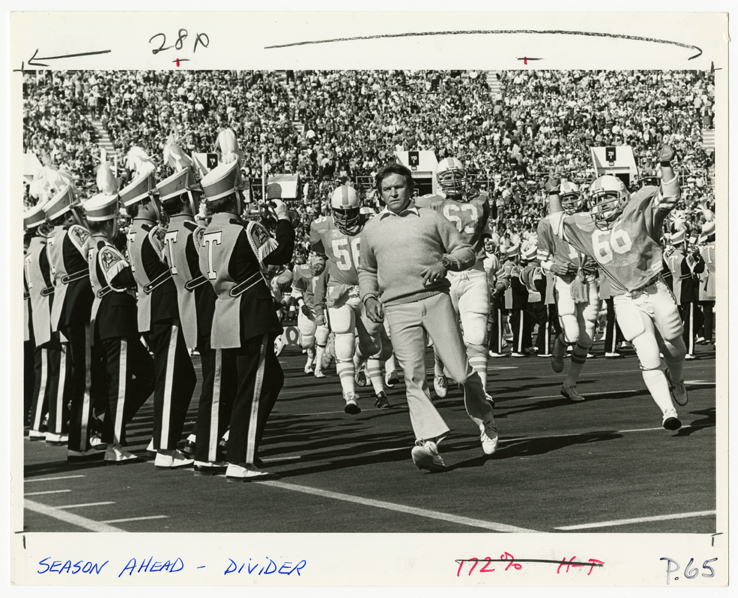 Coach John T. Majors running into the stadium before a game as coach of the University of Tennessee football team. 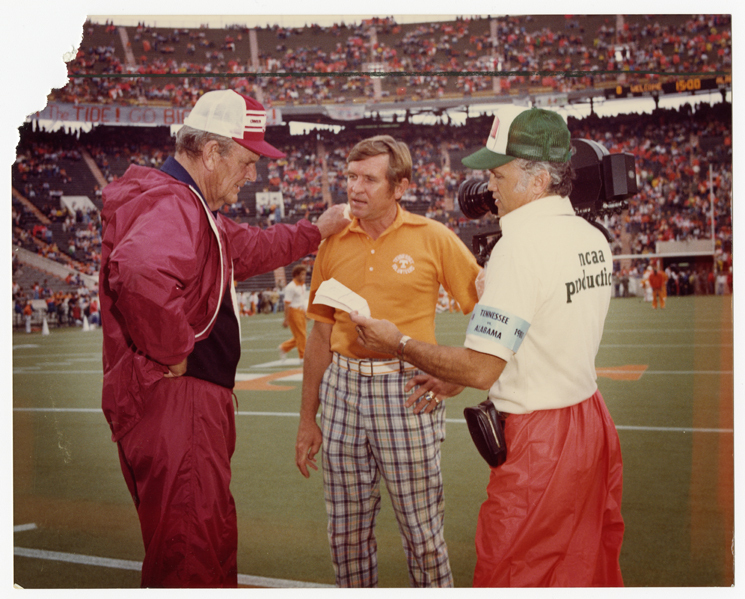 Coaches John T. Majors and Paul 'Bear' Bryant speaking on the field of the University of Tennessee's football stadium. A camera man is holding a camera and looking at a notebook but does not appear to be filming. 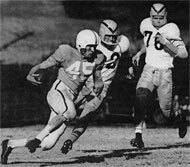 Johnny Majors running en route to his first collegiate touchdown for Tennessee in his first varsity game. The play was against Mississippi State. 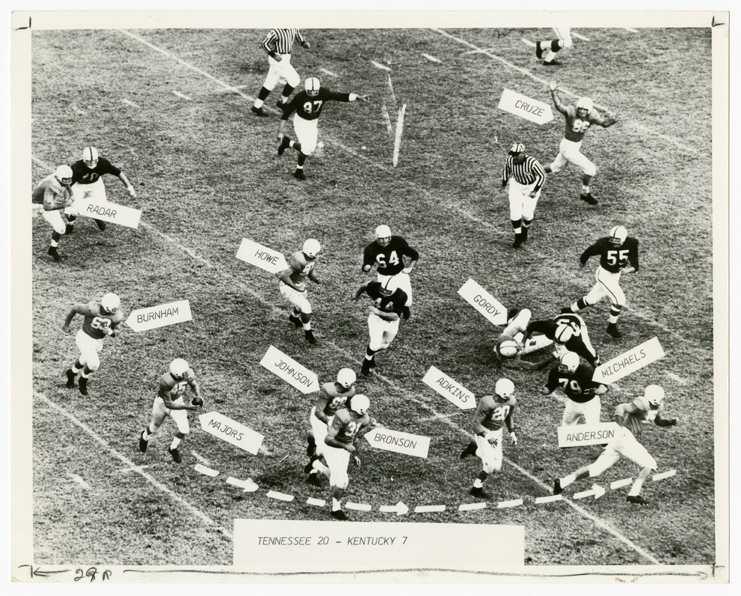 University of Tennessee (UT) on offense against the University of Kentucky. 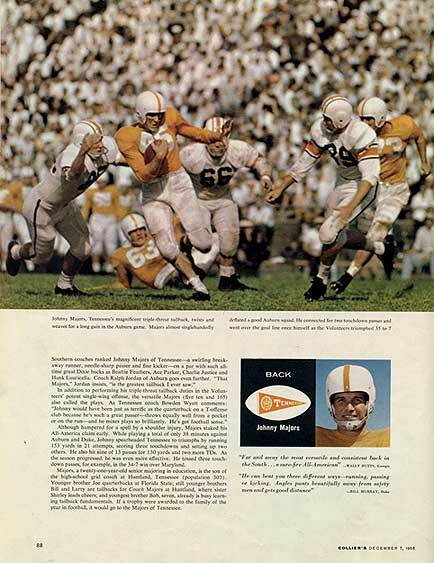 Johnny Majors has the ball and is moving to the right. The UT players are labeled with Majors's running lane labeled as well. The score of the game is also listed, Tennessee 20 ‐ Kentucky 7. 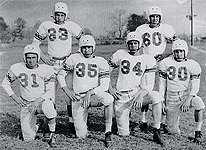 Front (l to r): John Majors, Jim McKenzie, Frank Broyles, Wilson Matthews, Bill Pace. 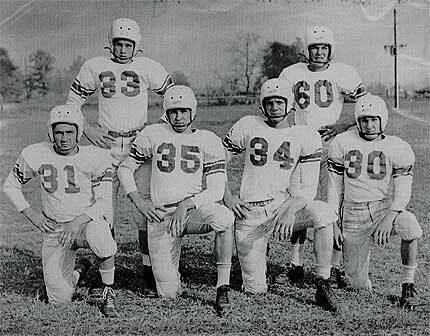 Back (l to r): Steed White, Jack Davis, Barry Switzer, Mervin Johnson, Lou Ferrel. In his first year as Pittsburgh’s head coach, Majors was voted Coach of the Year, when the Panthers went 6-4-1 for the season. The previous year Pittsburgh was 1-10. This award was especially meaningful for Majors, since that same year his father, Shirley Inman Majors, was voted small college Coach of the Year for his work at Sewanee. It was the only time a father and son had been so honored in the same season. 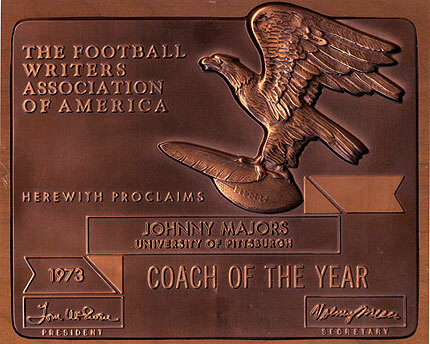 Majors received this prestigious award after leading the University of Pittsburgh to the National Championship in 1976.